Title IX At 40: What Has Changed, And What's Next It's been 40 years since the adoption of Title IX, the gender equity law that changed college athletics for both women and men. Commenting on the law's future, Frank Deford says that as women dominate college rolls, football fans might be in for a rude shock. The adoption of Title IX has spurred growth in women's collegiate sports, including soccer. But a women's pro league has struggled, cutting its season short this year. 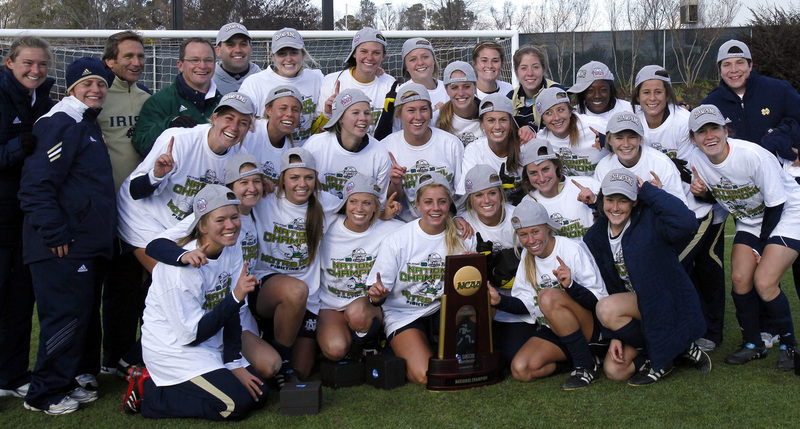 Here, Notre Dame celebrates winning the NCAA College Cup in 2010. Saturday is the 40th anniversary of Title IX, which, although almost nobody anticipated it then, resulted in women's gaining the right to participate in sports commensurate with their numbers attending college. Title IX not only had a huge effect on women's participation in sports, but also, culturally, it influenced the way both men and women view the idea of women and athletics. It's mattered greatly in our American society. But now, what of the future effects of Title IX? First of all, I see the potential of a great, grand collision between the old law and a recent major medical revelation. As the attendance of women in college has increased, so-called minor men's sports, like wrestling and tennis — even baseball — have had to be dropped to keep in compliance with the law. But now, as the number of women in college approaches 60 percent, while, concurrently, evidence mounts that football damages boys' brains, King Football may be the sport in jeopardy, especially as it's so expensive and has no female analogue. Already, in one prominent school district, it's been proposed that football should be eliminated — that schools have no business promoting a "gladiator sport." How ironic it would be that women's academic predominance would play a part in America's most popular sport being cut down at its roots. But on the other hand, even as women's participation in sport has soared, there's been no corresponding interest in women watching other women play sports. The only pro female team sport of any sustaining viability is the WNBA, which is allowed to serve at the pleasure of its NBA benefactor in basketball's off-season. The most visible women's sport is tennis — on those few weeks in major tournaments when the women gain a share of the spotlight alongside the more popular men. To be sure, yes, there are many female sports fans, but their numbers and passion are minuscule compared with the mass of male spectators. But so what? Androgyny be hanged. Sometimes the sexes simply have different tastes in amusement. Women, for example, read the vast preponderance of novels. Myself, I think we've already got "quota" enough of men being like men. But still, the question for the next 40 years of Title IX will be: Why can't a woman be more like a fan?